Palm tree drawings are easy images for trainee artists to produce successfuly. I know this because I drew them after only one year of teaching myself to draw. Ok, they're not a classic work of art but if you're like me and used to thinking you can't draw, any image you create is exciting! 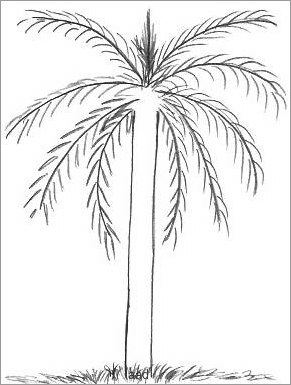 If you want a simple palm tree drawing that is already done and waiting just for you, then you are welcome to use my images for personal use. 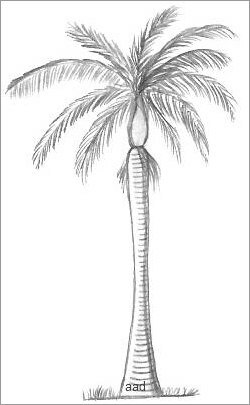 The illustration above is a royal palm tree which has a different trunk to most and there is a type of brown fibre growth at the join near the top. It's my favorite one on this page because it has some character. Here is my version of an outline of a palm tree for you to copy - I did a couple of quick sketches like this to get into the "feel" of creating this type of tree. The outline doesn't look very grand but it is sparse on purpose, to show the basic way to draw the tree. Observe that it consists only of a trunk and the leaves so it soon becomes obvious that palm tree drawing is truly an easy subject for all beginner artists to tackle! When you draw the leaves, it helps to visualize how they would normally fall from each branch. The leaves on the uppermost part of the branch would be barely visible so you draw the strokes almost parallel with the stem - this gives the illusion the leaves are falling downward. 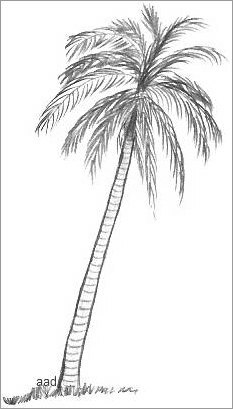 Here is my palm tree drawing that I completed after lightly sketching in the basic outline from above. The first thing you notice is that it is a little different to the original outline - this is called artistic licence, where we are free to change a drawing to however we want it to look. I started by drawing all the leaves at the top center of the trunk, to create the density of the leaves and I made the trunk thinner towards the top. With palm tree drawings, don't worry if the lines of the trunk aren't perfectly straight because most trees have lumps and bumps. Your imperfect bumps help to give a more natural look to the overall image so keep them as though they were intentional. After one year of copying all sorts of different topics, I find that drawing becomes easier on a daily basis and it's such a nice surprise. These palm tree drawings were a breeze and they didn't take much time to produce. 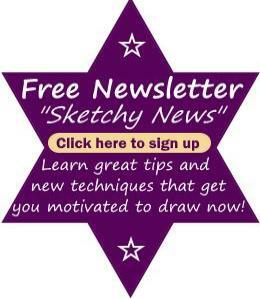 I hope you are inspired to test it out for yourself because that's my main aim with this website. Everyone should draw, it's good for your health! The majority of palms grow straight and tall with a single trunk. This drawing on the left is a coconut tree drawing and it illustrates the fact that they don't always grow straight up from the ground. You will also find some palms with several trunks growing from the same roots. The thickness of the trunk varies with all the different types of palms. The branches don't generally grow from the trunk - most of them are clustered at the top. Different palms also bear fruit with the most common fruits being dates and coconuts. Palms are mainly tropical trees and they can grow to 100 feet or 30 meters high. The majority of palms have large leaves and no branches. We use palm tree products for lots of things, ranging from cooking, to soaps, to furniture. It's a very versatile plant. I love the look of palm trees, maybe because they remind me of exotic places. While I was browsing for pictures to copy, I felt inspired to draw a coconut still in its outer casing, called the husk. It was an impromptu thing but it gave the session some variety so I didn't become bored. The drawing is copied from a good, clear photo and I quickly drew it freehand. Seriously, this is such fun but kinda sad that we waste many years telling ourselves we can't draw. My job is to show you that anyone can draw and once you decide that you can do this too, you will be a good hobby artist. Every one of us has a different drawing style and you will do well to keep your unique flair rather than try to change it. This video shows a simple technique for palm tree drawings. You are never too old to start drawing! It is a skill to be learned, not a talent that you are born with. Once you become interested in drawing, you notice that you start to see things differently and life takes on a whole new perspective. I love to use a mechanical pencil and I find it's perfect for drawing palm leaves and trunks. I often prefer to use plain photocopying paper for a lot of my sketches. Kick off your art session by copying these pencil drawings of palm trees. When you master how to draw one tree, start experimenting and draw something like a grove of palm trees. 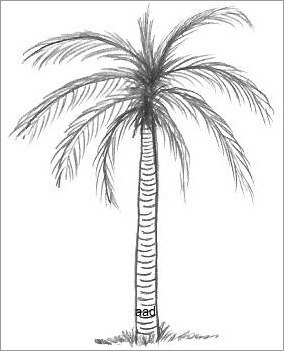 Have you remembered to put a date on your palm tree drawings? This is important because you can observe how much you improve over a period of time. I wish you all the very best with your artistic adventure.